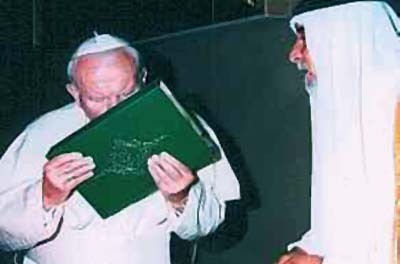 May 14, 1999 - John Paul II kisses the Koran (Qu'ran) at the Vatican. "At the end of the audience the Pope bowed to the Muslim holy book, the Qu'ran, presented to him by the delegation, and he kissed it as a sign of respect. The photo of that gesture has been shown repeatedly on Iraqi television and it demonstrates that the Pope is not only aware of the suffering of the Iraqi people, he has also great respect for Islam." For the full text of the interview, click here.